You like moving your body to music. 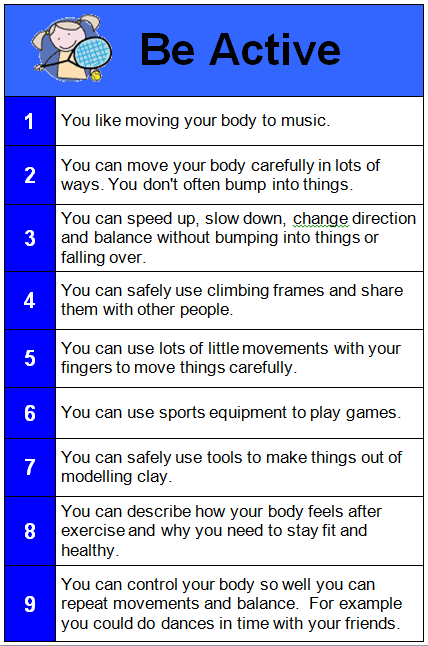 You can move your body carefully in lots of ways. You don’t often bump into things. You can speed up, slow down, change direction and balance without bumping into things or falling over. You can safely use climbing frames and share them with other people. You can use lots of little movements with your fingers to move things carefully. You can use sports equipment to play games. You can safely use tools to make things out of modelling clay. You can describe how your body feels after exercise and why you need to stay fit and healthy. You can control your body so well you can repeat movements and balance. For example you could do dances in time with your friends.